Boiler providing steam for process heat. Fuel-based process heating systems generate heat by combusting solid, liquid, or gaseous fuels, then transferring the heat directly or indirectly to the material. Hot combustion gases are either placed in direct contact with the material (i.e., direct heating via convection) or routed through radiant burner tubes or panels that rely on radiant heat transfer to keep the gases separate from the material (i.e., indirect heating). Examples of fuel-based process heating equipment include furnaces, ovens, red heaters, kilns, melters, and high-temperature generators. Steam-based process heating systems introduce steam to the process either directly (e.g., steam sparging) or indirectly through a heat transfer mechanism. Large quantities of latent heat from steam can be transferred efficiently at a constant temperature, useful for many process heating applications. 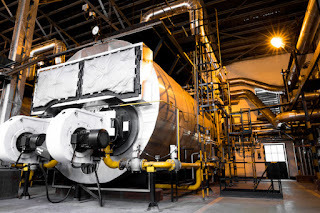 Steam-based systems are predominantly used by industries that have a heat supply at or below about 400°F and access to low-cost fuel or byproducts for use in generating the steam. Cogeneration (simultaneous production of steam and electrical power) systems also commonly use steam-based heating systems. Examples of steam-based process heating technologies include boilers, steam spargers, steam-heated dryers, water or slurry heaters, and fluid heating systems. Electricity-based process heating systems also transform materials through direct and indirect processes. For example, electric current is applied directly to suitable materials to achieve direct resistance heating; alternatively, high-frequency energy can be inductively coupled to suitable materials to achieve indirect heating. Electricity-based process heating systems are used for heating, drying, curing, melting, and forming. Examples of electricity-based process heating technologies include electric arc furnace technology, infrared radiation, induction heating, radio frequency drying, laser heating, and microwave processing. Hybrid process heating systems utilize a combination of process heating technologies based on different energy sources and/or heating principles to optimize energy performance and increase overall thermal efficiency. For example, a hybrid boiler system may combine a fuel-based boiler with an electric boiler to take advantage of access to lower off-peak electricity prices. In an example of a hybrid drying system, electromagnetic energy (e.g., microwave or radio frequency) may be combined with convective hot air to accelerate drying processes; selectively targeting moisture with the penetrating electromagnetic energy can improve the speed, efficiency, and product quality as compared to a drying process based solely on convection, which can be rate-limited by the thermal conductivity of the material. Optimizing the heat transfer mechanisms in hybrid systems offers a significant opportunity to reduce energy consumption, increase speed/throughput, and improve product quality. For more information, visit www.ivesequipment.com or call (877) 768-1600.